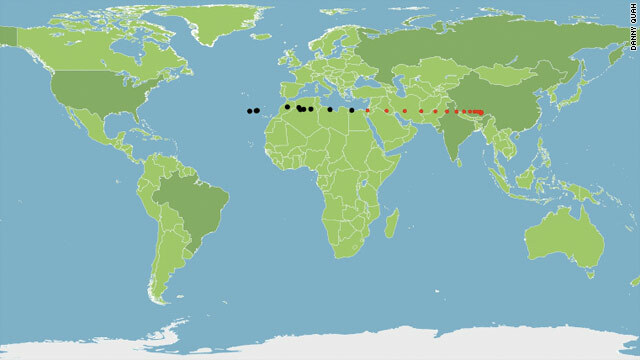 The global center of economic gravity has shifted east over the past 30 years (black dots), and could well shift even farther east over the next 30 years (red dots). Editor's Note: Danny Quah is a professor of economics at the London School of Economics and author of the new paper, The Global Economy's Shifting Center of Gravity. As late as 1980, North America and Western Europe produced more than two thirds of this planet’s income. Not unexpectedly then, the world economic center of gravity 30 years ago was a point deep in the middle of the Atlantic Ocean, 900 miles west of Morocco. By 2008, however, because of the continuing rise of India, China and the rest of East Asia, that center of gravity had shifted to a point just outside Izmir Turkey, east of Helsinki and Bucharest - a drift of 3000 miles, or about three quarters of the Earth’s radius. My projection has it that this move east will continue until 2050 when the world economic center of gravity will cluster on the border between India and China, 400 miles east of Katmandu. Let me explain what I mean by "global center of gravity." Because Earth is curved, the straight line connecting New York City and London plunges deep beneath the Atlantic Ocean. The half-way point on this line is desolate and miserable: it is cold, wet, and hundreds of miles beneath the waves of the Atlantic. If you were to rise straight up to the surface from that depth, there would be absolutely nothing around except thousands of miles of water in every direction. Since New York generates higher income than London, the midway point doesn’t represent the economic activity of the two cities combined. Instead, the economic center of gravity shades towards New York, moving west proportionally to the extent New York’s income exceeds London’s. If you add in a third point, to account, say, for the income being generated in Shanghai, the triangle of cities - New York, London, Shanghai - would have an economic center of gravity somewhere between the three, pulled with varying strength between each of the triangle’s vertices depending on the incomes in each of them. If you then add into the mix all 700 locations on this planet individually identifiable as urban agglomerations and rural centres, then you would have the world economic center of gravity. Since incomes and populations change through time, so too does the world economic center of gravity shift about on Earth. To visualize this on a map, it is convenient to ‘float’ that center of gravity towards the planet’s surface: doing so produces the map above. Together with this growth, 600 million people have been lifted from extreme poverty - a large and rapid improvement in the well-being of humanity that is unprecedented in the history of this planet. But more is to come. Today, the income of the average person in this Eastern conglomerate is still lower than that of his or her counterpart in a dozen countries in Africa; his carbon footprint is less than one quarter that of the average American; and his or heir sights are set on making not just refrigerators and running shoes, but solar panels, wind turbines, and nano-cars at a cheap enough price that yet more of humanity can afford them. Next entry »The month that remade multilateralism? The main reason for this shift is the unquenchable global ambitions of the U.S.,Great Britain and France for the conquest of weaker nations and their resources. That's why they're involved in all these obnoxious wars. Onesmallvoice are you that ignorent ? (to not say stupid) First i wana point out that the nature of progress and development iis that when people get far ahead (economicly , militery whatever) they end up changing the general balanance and the envierment that helped them get ahead so they start to dig there own decline or lack of progress . So as contrys like China have great leaps now they are at the same time creating the roots of there problems later on. And we should not forget that China and India make like 2/5 of the world population , it would be incredible if they would stagnate. The world is much more interconnected and complex then people give it credit and change is the only common theme. Prof. Danny. Americans, as is, are already paranoid enough, just short of trumping up a shooting war with China. Can you please tone down your "research", and better yet file it in your basement and wait for 50 years before publishing them? Please let the world be a more peaceful place. The economic growth of a nation is a cyclical phenomenon. Each country on earth has its turn to enjoy prosperity for a – long or short – period of time. Thank you, I've recently been searching for information about this topic for a while and yours is the best I have found out till now. But, what concerning the bottom line? Are you certain in regards to the supply?|What i don't realize is in truth how you are no longer actually a lot more smartly-liked than you might be now. You are so intelligent.